Bringing the metropolitan lifestyle of New York living to your home, the Manhattan is a modern and stylish kitchen. Still In-Frame, but with a modern German hinge, and no handles. The chic design incorporates high-end materials while maintaining the minimalistic feel that is associated with luxury Manhattan life. Think of tall apartments and high rise living, or quayside balconies looking out onto the Hudson. 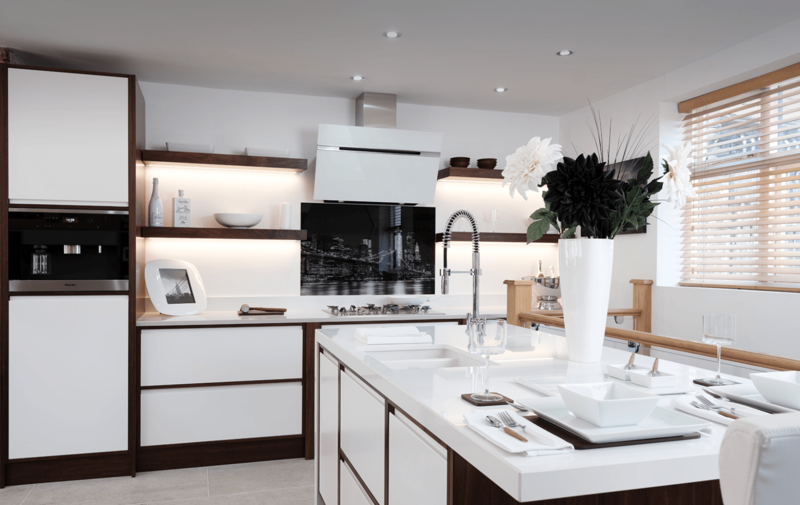 This kitchen is suitable for an urban home or apartment with its contemporary look and features. The Manhattan kitchen would not look out of place with the homes of those on the New York skyline. This complex yet highly functional kitchen benefits from a number of unique features including handle-less in-frame doors, with or without square pilasters, in any wood finish or painted in any colour imaginable. Floating shelves and wide pan drawers with concealed inner drawers, islands with waterfall sides and extra thick worktops, and shark-nose edges. A style suited to young professionals looking to make a statement in their home. This complex yet highly functional kitchen benefits from a number of unique features including handle-less In-frame doors, with or without square pilasters, in any wood finish or painted in any colour imaginable. Using the Manhattan style, our craftsman are able to develop the design into handmade furniture such as wardrobes, bookcasing, sideboards, media cabinets and more. We can bring the same elegancy to every room in your house, whether it is for your dining room, lounge, study, bedroom or bathroom. To find out more about our work around the home, get in touch with us today to add a truly unique piece of furniture.